Our Thrust Bearings Have a New Color! 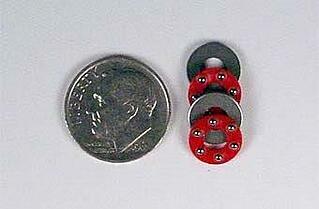 We’re excited to announce a change is coming to our line of thrust bearings. Thrust bearings turn up in a lot of places. From valves to pressure gauges to surgical tools, thrust bearings make their way into a wide variety of industries and applications. Over the years we’ve had the opportunity to work with a number of companies that represent a vast array of thrust bearing applications so we thought we’d share with you some of those specific, real-world applications. Carbon Steel vs. Stainless Steel Bearings | What is The Difference? 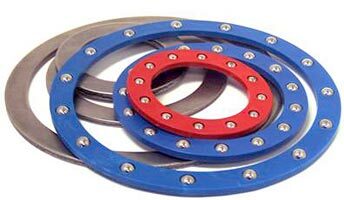 Seeking a reliable thrust bearing for a signature rotating product, Rainbow Crossings needed a supplier who could provide a thrust bearing with smooth, continuous action without large volume ordering requirements. Designed to permit motion between two parts while supporting an axial load, thrust bearings need to combine both strength and bearing life. Most thrust bearings use all metal fabrication, for maximum strength, but all metal bearing retainer lack a number of benefits that our combination of nylon retainer and hardened carbon steel thrust bearing washers provide. All Torque Transmission thrust bearing designs incorporate the optimum combination of molded nylon retainer, heat stabilized 6/6 nylon held to a rigid design criteria assuring consistent quality, with hardened grade steel balls ,100 tolerance (±.0001", ±.0025mm), and washers that are hardened to RC 59 to 61 and finished to a 10 micro inch surface. While it is not uncommon to find thrust bearings in applications like pressure gauges, surgical tools and equipment, they can also be used in other applications like valves. Lubricity is important because it reduces the friction and wear on moving components. Many power transmission components use grease or oil to add much needed lubricity. Torque Transmission’s thrust bearings, which include Nylon retainers do not require grease and here’s why.